I have a group of girlfriends from my days in graduate school that like to go for brunch/afternoon tea every so often. Our usual jaunt is O&B Cafe but we thought we would try something different and my friend G suggested Cafe Belong. 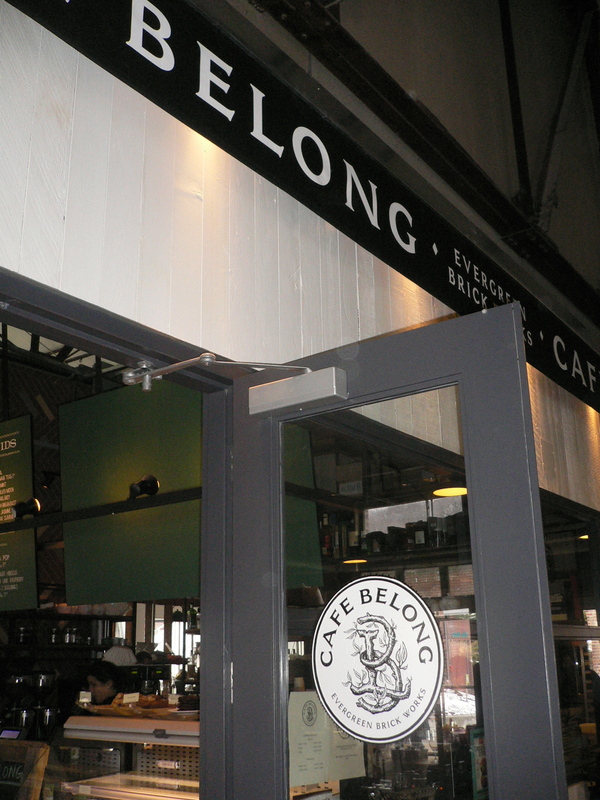 Cafe Belong is in a unique location within the Evergreen Brick Works – an environmental centre run by a national charity. Dying to find a new place to have a good meal and chat with friends, we decided to check it out. My friends G, H, M and E got together for brunch and atmosphere was very comfortable and casual – perfect for a lazy weekend. Little did I know that Cafe Belong is owned by executive chef Brad Long who, if anyone watches restaurant makeover knows who I’m talking about! I ordered the smoked trout frittata and it was delicious! 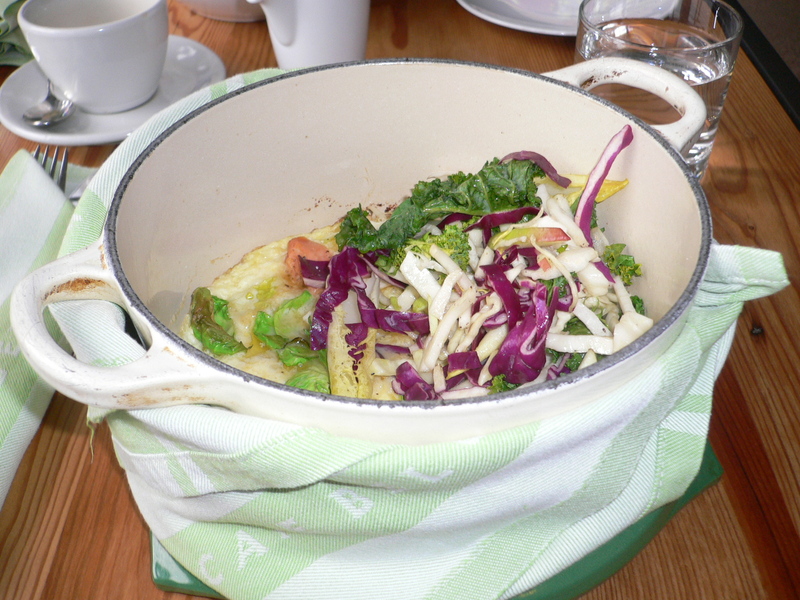 It arrived at the table in a small green individual Le creuset crock pot, the eggs light and fluffy with a good sized trout filet – on top sat a bitter salad and pickled vegetables. It was a perfect size for a brunch meal, light yet satisfying and at a very reasonable price, $18. The cafe also makes their own grab and go menu – brownies, scones, etc. and best of all, their own sodas! The hibiscus soda was refreshing! If you’re looking for a great place for brunch, this is it! Smoked Trout Frittata with bitter salad and pickled vegetables. 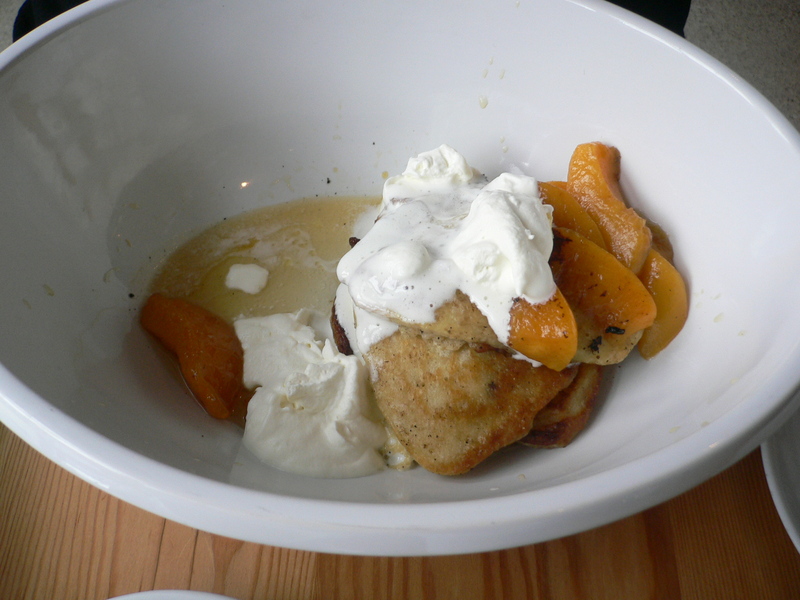 Oatmeal pancakes with bourbon peaches. 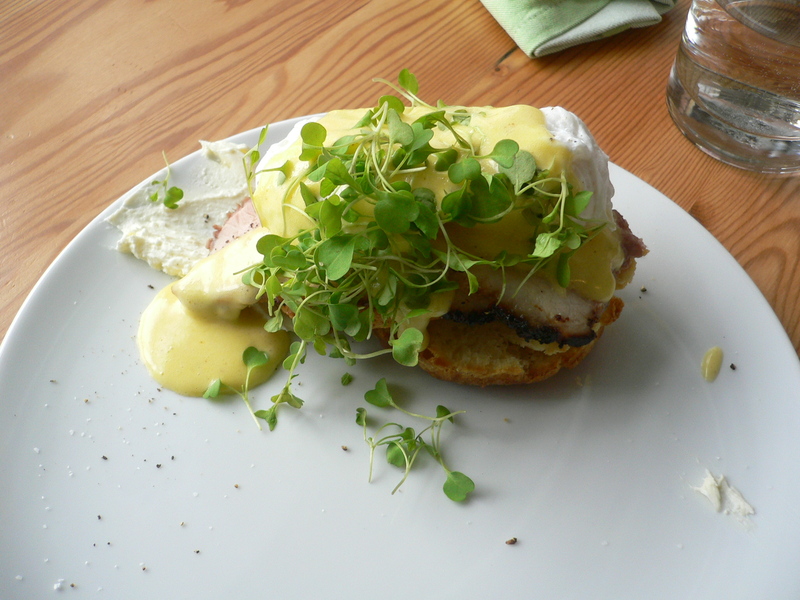 Eggs Charlotte – poached eggs and hollandaise on a biscuit. Great post! I've been really wanting to visit Cafe Belong. Brad Long used to be the executive chef where Vince works and so they worked together a bit. Then Chef Long left to open Veritas (now owned by someone else) and so Vince and I decided to have our wedding reception there (you know, since we knew the food would be awesome). We're huge Brad Long fans so we're happy to hear that you had a good experience. It's next up on my list! wow! To have your wedding reception catered by Brad Long, must have been such a great meal! Any other chefs you're a fan of?